Every network capable device must have unique MAC address assigned by the manufacturer. Media Access Control (MAC) address is hexadecimal code separated with colon “:” or hyphen “-” and MAC address is unique even two devices of same type. Most common use of MAC addresses by the network administrators is to allow a specific list of computer to access internet by entering in the wireless router settings. If you are trying to find MAC address of your Wireless adapter (PC, Desktop, Laptop) then here is the method to locate it. This guide is created in Windows 7 but this may Work in other Windows OS versions like Vista and XP. Press Windows + R keys from keyboard. 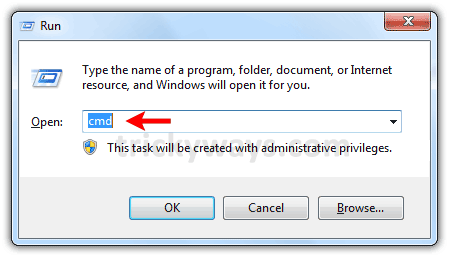 Type “cmd” in the “Run” window and hit enter key. 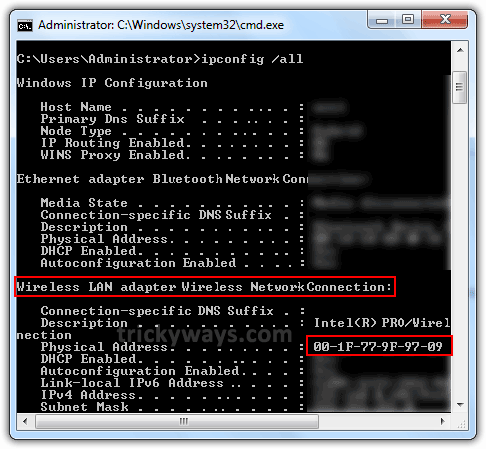 In the command prompt type “ipconfig /all” command and hit enter key then find the Wireless MAC address under “Wireless LAN adapter…” section as shown below, 00-1F-77-9F-97-09 is Wireless adapter MAC address or Physical address. In the command prompt type “getmac” command and hit Enter key, wait for a while to detect it the MAC address / Physical Address. how can i find Wireless Mac Address on Mac system? What are these other information when i execute the command to find mac address. Thank’s for the information. Very usefull. Very useful article to find physical/mac address on Windows computer. Thank you for sharing this knowledge. It saved hours of frustration! Thank’s for very helpful & easy tutorial . Very Nice Site. Thanks for spending your time in writing such a informative article.